Busted and McFly join together to make pop supergroup McBusted! McFly are always doing cool things that most bands don’t do, whether it’s making video blogs showing how they write songs or Tom singing his wedding speech. And now they guys are doing something new by joining up with ex-pop band Busted. 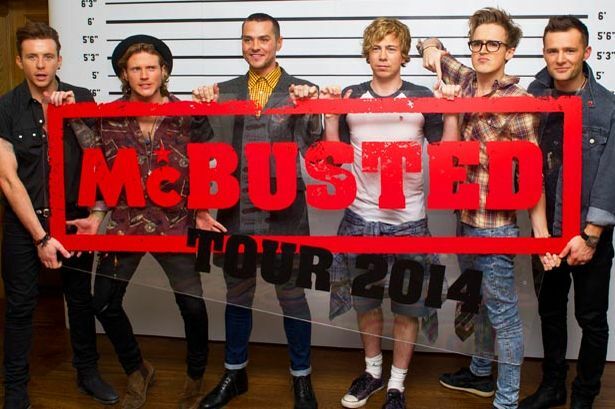 Watch McBusted ‘crash the cinema’ and surprise Tourplay fans! McBusted announce self-titled debut album! We play a fair bit of Busted on Fun Kids. They were around a few years ago, until they split up, playing songs quite similar to McFly’s guitary pop rock sound. So together, the 6 lads should sound pretty amazing. You can see the new supergroup McBusted this Friday on Children in Need and they will also be doing a tour in 2014 so you can go and see them live. Are you excited about McBusted? Let us know in the comment box below. Want to hear a Busted tune? Check out ‘Crashed the Wedding’ below. Listen to McBusted first-ever single Air Guitar! Watch McBusted's live intro at the SSE Hydro in Glasgow! Busted/McFly supergroup McBusted confirm they'll be making a whole album! McBusted will support One Direction at Paris gig!